Simon Says Stamp Fresh Bloom release! 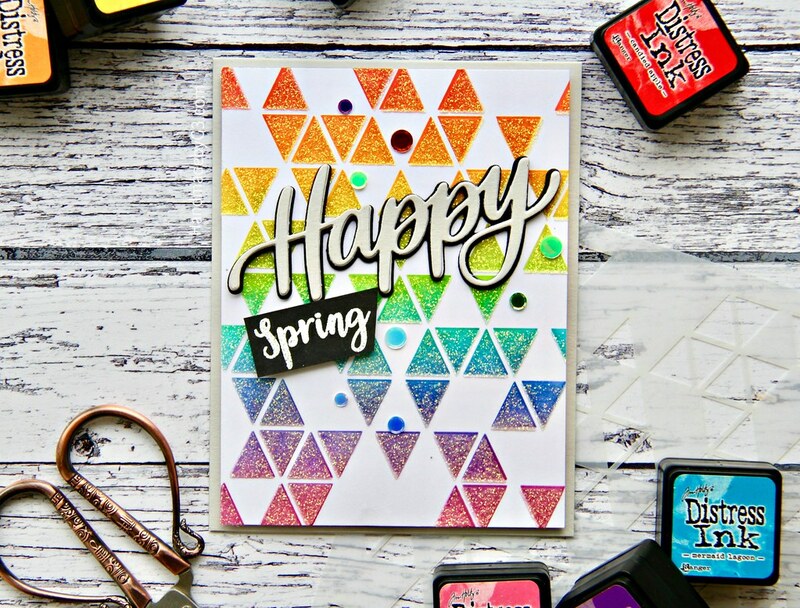 I am excited to share my project using Simon Says Stamp’s new release – Fresh Bloom collection. This release is spring and easter themed products. Absolutely beautiful. You can find them at Simon Says Stamp Store. 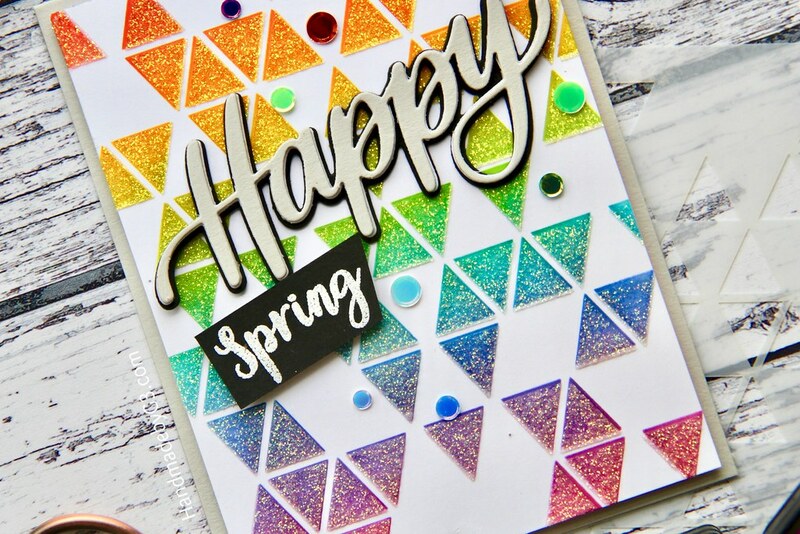 I have used the new Triangle Blast stencil to make my card today. I love stencils. This one is right up my ally because of the geometric design. 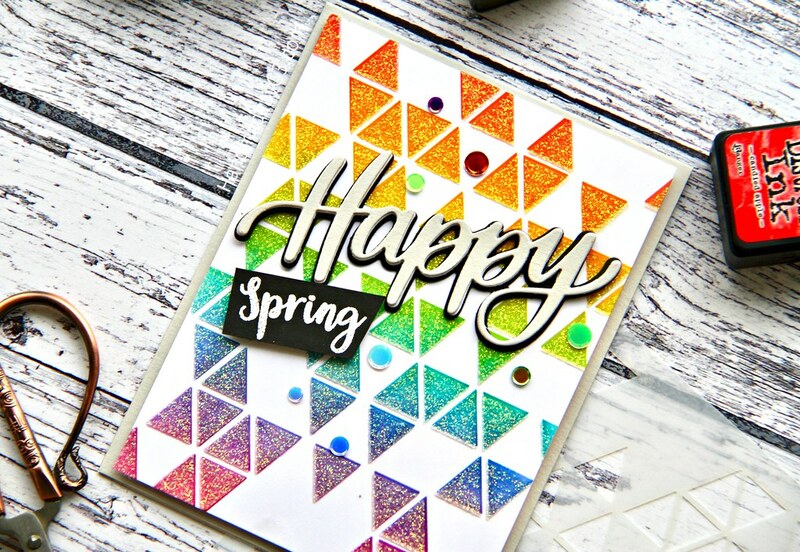 Since I am a bit obsessed with rainbow colours and Moonstone glimmer paste, I made a rainbow sparkly background using this stencil. I adhered the sparkly rainbow triangle black background panel on Fog card base using craft foam. For the sentiment, I used an oldie die called Big Happy die. I die cut the shadow using black cardstock and the happy die is stacked and glue to get dimension. The top happy is die cut using Fog cardstock which coordinates with the card base. The small sentiment from the new Bunny Wishes stamp set is white heat embossed on black cardstock, trimmed and adhered using foam adhesives. Finally adhered a few Simon’s Groovy confetti to finish off the card. Thank you very much for stopping by! Happy shopping! beautiful cards…absolutely love the bunnies! !